How will Europe's energy system look like in 2030? Which aspects of the transition are particularly important? The 2030 targets for decarbonising the EU economy have been agreed, but what does this mean concretely for the European energy and transport systems? 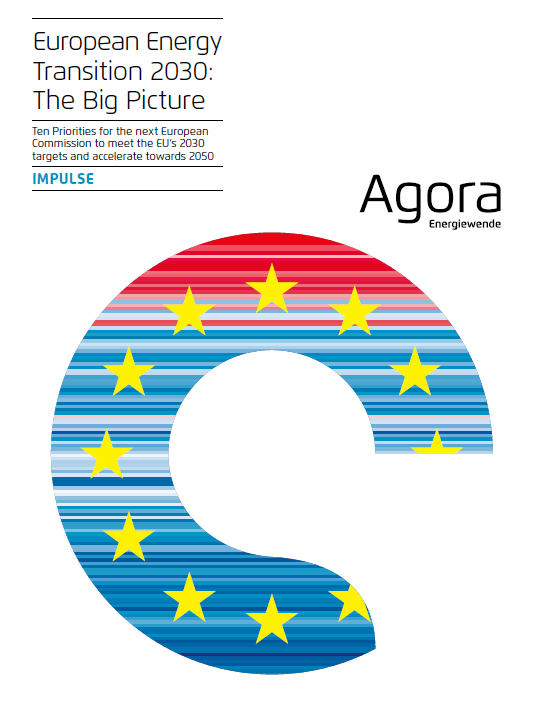 In a new publication Agora Energiewende is providing exactly this "Big Picture" of the EU energy transformation until 2030. Based on an analysis of where we are today and where we need to be in 2030, the authors propose ten priorities and four flagship initiatives to make the European energy transition a success. Ecologic Institute supported Agora Energiewende in developping the publication. Chapter 2 describes the mega-trends which drive the energy system, such as digitisation, automation or falling costs of clean energy technologies. Independent of policy decisions, the mega-trends will shape the context in which the energy transition takes place. Chapter 3 makes the case for a strong European Union to help citizens and governments to cope with concrete issues that will arise in implementation and devise innovative solutions for new issues that will arise on the way. Chapter 4 and Chapter 5 describes comprehensively how today’s energy system (power, buildings, transport as well as the industry sector) will change to be consistent with the 2030 climate and energy targets, as well as what it will mean in terms of investments, costs and benefits for industry, households and the EU economy as a whole. Chapter 6 gives an overview on the EU's 2030 climate and energy framework adopted over the course of 2016 to 2019 and highlights the main implementation challenges at the national level and the EU level. Chapter 7 presents ten EU-level initiatives to decisively advance Europe’s clean energy transition. Finally, Chapter 8 highlights the important role that early and decisive action for advancing a just European energy transition will play in creating the political foundation for further raising the EU's climate & energy targets.